Bespectacled man: I can't find my glasses. Woman: You're wearing them on your head. Silly you! Off-panel voice: Remember when you couldn't find our baby? The woman is shown imagining herself standing, carrying an infant in one hand, and saying: Honey, I can't find our baby! Woman: That's different. I was carrying the baby, not wearing it on my head. Bespectacled man: How's that different? Bespectacled man: ...when you were wearing our baby on your head. The woman is shown imagining herself wearing a bowler hat with an elongated rim. An infant sits on the top of the bowler hat with only its upper torso and head visible above the hat, and with its arms dangling down the side of the bowl of the hat. 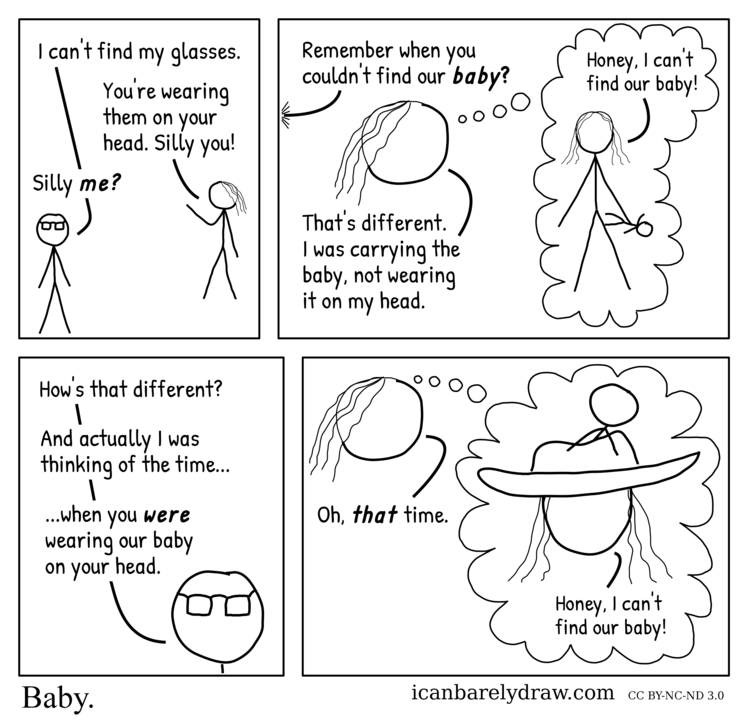 The imagined woman says: Honey, I can't find our baby!